People often think that the terms millennial and Generation Z are interchangeable. Millennials are technically Generation Y, while Generation Z is younger - born between 1995 and 2015. With the eldest of this generation graduating from college and starting their careers, it’s important for career fair recruiters to know who they’re talking to. In a world where technology is constantly changing, it’s crucial to pay attention to what is popular. In the past few years, the right platform to recruit young professionals has changed several times. As Facebook and Instagram start to lose steam, recruiters are changing their strategies. Today, career fair recruiters are using the app, Snapchat, to reach their audience. Even major corporations like McDonald’s and Goldman Sachs, have utilized this social media application for their recruiting efforts. Just as the social media platforms evolve and change, so do recruiting resources. Today there are several new recruiting tactics involving AI, analytics, and machine learning. For example, Google Hire is a recruiting app that distributes jobs, identifies candidates, and manages the interview process. Companies that use new tools like these will be viewed and favored more by Generation Z. Career Fair Plus understands the benefits that come when utilizing new digital tools. It is for that reason we have started to roll out our latest feature allowing recruiters to upload videos to the Career Fair Plus app. These videos are a great way to engage students before the day of the fair. As generations grow older, attention spans get shorter. To capture and keep the attention of Generation Z, career fair recruiters must make their messaging eight seconds or less. Recruiters should also avoid long, lengthy text and opt for attention-grabbing images, videos, or even emojis. Generation Z was raised looking up Yelp reviews and giving Facebook ratings before and after visiting restaurants. Because of this, companies must work to manage and maintain a positive image on websites like Indeed and Glassdoor. These platforms allow employees to rate and review companies based on how it is to work there. According to David Stillman, a Gen Z guru, Generation Z prefers an independent work environment. Unlike millennials who would rather a collaborative setting, Gen Z fancies solo projects and private offices. Another Gen Z expert, Ryan Jenkins, told Forbes that companies should also introduce more fluidity into positions. “Seventy-five percent of Gen Z would be interested in a situation in which they could have multiple roles within one place of employment,” explains Jenkins. This desire comes from a generation growing up with evolving technology and a growing economy. 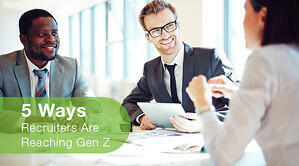 It’s important for career fair recruiters to remember that Generation Z is unlike any other. While they may seem similar to Gen Y, or millennials, their wants, needs, and outlooks are very different in the realm of recruiting.